The First World War had its own Super Bowl! 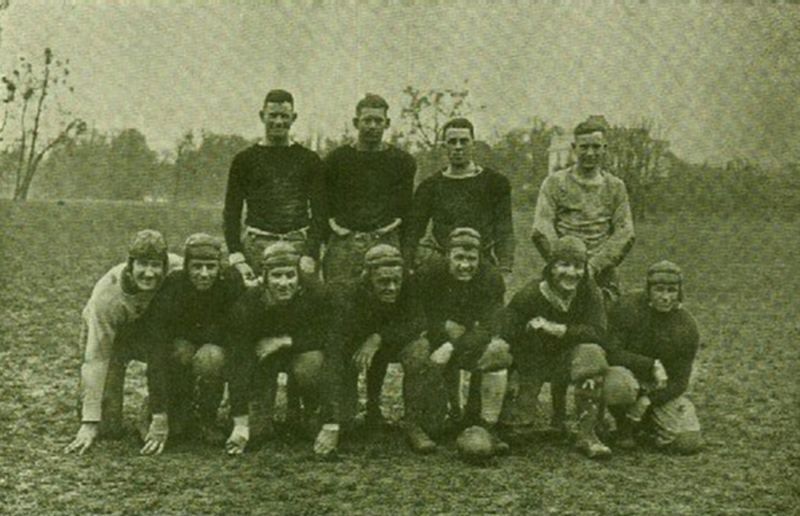 The divisions and large bases of the American Expeditionary Force in Europe had their own football tournament. 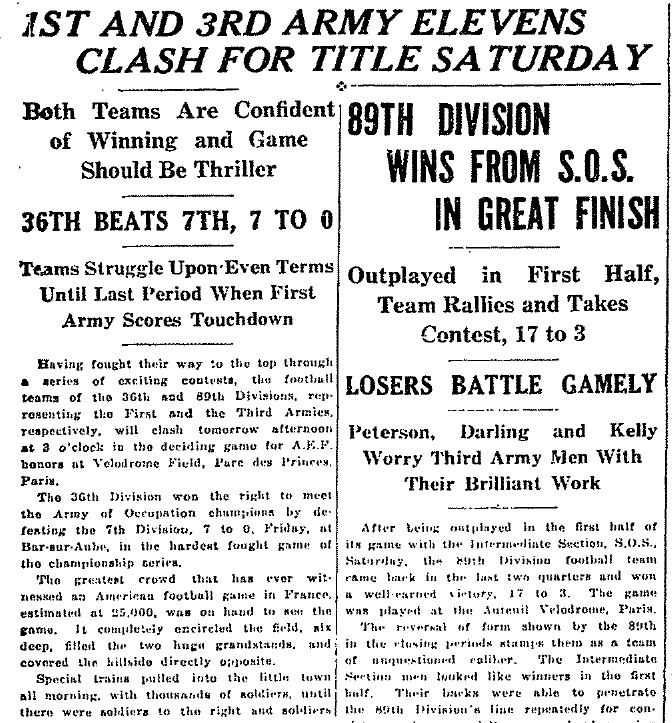 The championship game between the 89th (Midwest Division) and the 36th (Texas-Oklahoma National Guard) divisions was played on 29 March 1919, before a crowd of 15,000 at the Paris Velodrome that included General Pershing. The field was muddy, but the football played was of the highest order. In the first quarter the 89th worked the ball to the one-yard line and on the fourth down tried for a field goal, but the slippery ball went wide. After neither side had gained much advantage in close play in the middle of the field, Mahseet delivered a terrific punt that carried more than fifty yards and passed the safety man of the 89th, who let it roll over the line for a touchback. On the first play, the ball was passed badly to Lindsey, who fumbled and the ball rolled over the line. McCuller fell on it for the first touchdown of the game. Mahseet missed goal. The quarter ended without further scoring. Between halves, in addition to the usual scorching talks from the coaches, General Winn spoke to the team. Many of the players afterward said that his appeal to their pride in the division, his encouragement of their efforts, was one of the most effective of such appeals that they had ever listened to. Certain it is that something was instilled into the team between halves that called forth reserve powers that had not been displayed before. Beginning the third quarter, Lindsey returned the Indians' kick-off 41 yards by one of the most brilliant runs of the game. In three plays on the line the 89th gained first down. The 36th then stiffened and a punting duel followed, in which a blocked punt gave the 89th the ball on the seven-yard line, but a fumble by Clark lost the chance to score. Finally a pretty forward pass to Clark and a run netting 22 yards put the ball within striking distance. Lindsey and Gerhardt dropped back as if to try for a field goal. Gerhardt received the ball, shot it back to Lindsey, who passed it far down the field to Clark. Clark received it almost on the goal line and stepped across for the first touchdown. Clark kicked a difficult goal, and the 89th, amid a bedlam of cheering, went into the lead, not to be headed again. The final score was 14 to 6, the 89th, as usual, coming from behind and emerging with the victory after it had seemed that the game was lost. Before the close of the game, General Pershing came upon the field, personally greeted the players and congratulated them on their splendid game and fine spirit. Paris was not dull that night. I'll wager that no one took a knee during the National Anthem! So true Jay!! I will also say that the veterans of the Great War from Ironton, Ohio, formed their own football team: the Ironton Tanks. The name itself would inspire fear in their adversaries on the gridiron. The veterans named their team after the Tanks that they saw on the battlefields of Europe. 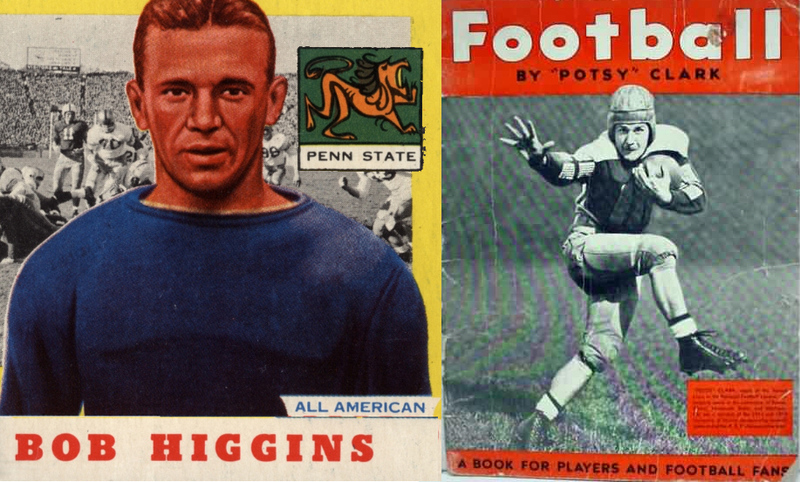 These veterans were the beginning of the NFL and defeated the New York Giants, the Chicago Bears and the Cincinnati Redlegs in the 1920’s. I might highly suggest the book “Home and Away: The Origins of the NFL on the Banks of the Ohio”. Available on Amazon. Ironton, Ohio, is also the home of America’s second highest scoring ace in the First World War: Wm. C. Lambert. There is also a book about him: “ Wm C. Lambert: World War 1 Flying Ace” by Sam Wilson. The Princeton football and hockey great, Hobie Baker, was the most eminent American collegian to lose his life as a member of the A.E.F. Baker had received his orders to return stateside but made one more flight in a SPAD of his 141st Aero Squadron, on Dec. 21st of '18. There is commentary about that Baker, the squadron C.O., doubted the contention of another pilot that the SPAD he was assigned had a recurring fuel feed problem and was not air worthy. Baker proved the other pilot was correct when the engine in the SPAD failed and dove into the ground in a crash that killed Baker at 26 years of age. The Princeton Alumni website has a great story re the magnificent epitaph present on Baker's headstone. He was a true immortal and the inspiration for F. Scott Fitzgerald as he crafted his stories of the Jazz era. As the original Madison Square Garden opened it's run as the premiere indoor arena of NYC, on the marquee was, simply emblazoned, the phrase: "Hobey Baker Here Tonight."